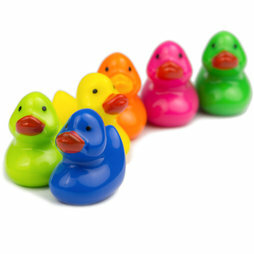 In order to have fun with these very colourful mini rubber duckies, you don't even have to draw a bath. These cute deco magnets shaped as ducks are made for setting colourful accents on your magnetic board. The embedded disc magnet is responsible for quite the holding power. Since the super magnet is embedded into the resin - and not glued on it - only close inspection will expose the little duck as a deco magnet. Our colourful duckies were quite happy to be back after their little excursion to the lake. Water is just not their thing. But they really like to hang out on your magnetic board. The duckies look especially pretty in this transparent gift package. The hip set of 6 makes for a great gift for people who like playful and colourful things. One magnetic duck holds up to 7 DIN-A4 sheets of paper.